Introduce your bland space to this beautiful hanging Live Ivy Topiary. The thousands of tiny leaves on this Fresh Topiary will give any setting a visual sense of vitality and life. These Live Topiary Plants are small enough to fit in nearly any space while delivering a large impact of nature and natural beauty. This Angel Vine Topiary is a wild random configuring of stunning purple vines that continuously grow to long lengths that intertwine with each other creating a unique visual experience. The new chutes emerging from the 6" pot stand up boldly, lending an unusual and whimsical fullness to this Live Ivy Topiary. The tiny leaves adorn the entire length of each vine, increasing the visual appeal of this 2.25 pound Live Ivy Topiary. Once you have decided on where you are going to hang your Angel Vine Fresh Topiary, it is essential to know how to care for it. This Live Ivy Topiary prefers to live in temperatures that range from 40 to 80 degrees Fahrenheit, regardless of whether it is kept indoors or outdoors. As this Live Ivy Topiary grows, it will be necessary to prune the vines to retain the shape that you desire. When it comes to watering this type of live ivy, it is important to regard the environment that the Live Ivy Topiary will be located in. When hanging in a location such as an office or enclosed room, it may be necessary to water more often than if the plant is hung in an outdoor setting such as a patio or on a plant hook in a semi-shaded area. The leaves and vines of the Live Topiary Plants are delicate and require bright but not direct sunlight. This type of Live Ivy Topiary enjoys being in moist but not soaking wet soil. The potting material should not be allowed to sit on the roots of the plant. This will cause over-watering and drown the plant; it will also cause the leaves to die and fall off resulting in a negative visual appearance. Allowing the soil to dry out moderately between waterings will ensure that your Live Ivy Topiary is well fed, healthy and happy. 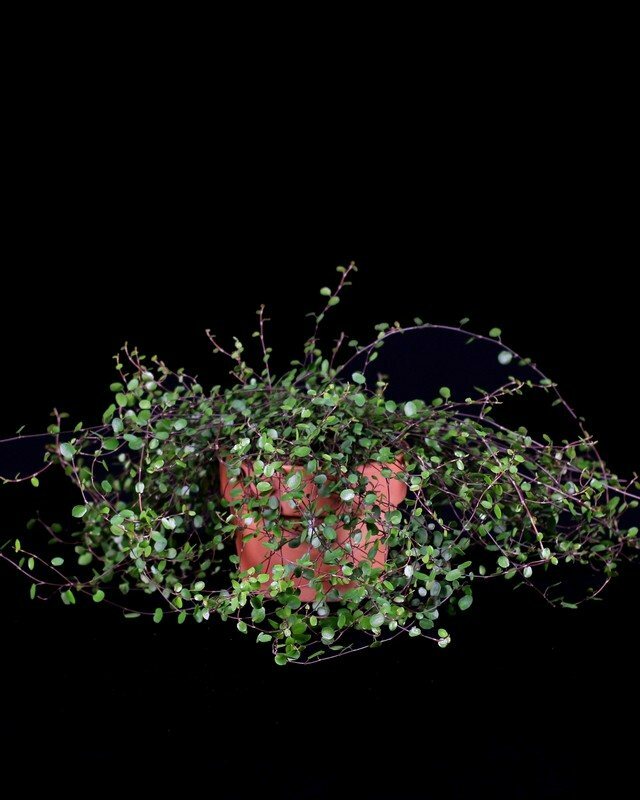 This variety of Angel Vine Live Topiary Plants is available with a Mylar Spring Wrap that can be obtained as a choice at the time of checkout. This decorative sheet of Mylar will help to hold in moisture, prevent spillage from over watering, and it gives the vessel a finished look when being presented to someone as a gift. There is also the option of purchasing a 6" Terracotta pot to replace the standard plastic pot that houses the Live Ivy Topiary. When looking for a visually pleasing Live Ivy Topiary, this Hanging Angel Vine Topiary will fulfill your every need. It offers a daintiness and visual interest that can not be found in many other indoor or outdoor plants.